If you were wondering what thing you could possibly not avoid in Germany is, the picture above says it all. Of course, I’m talking from a mental, emotional and historical perspective. If you don’t want to go visit one, it’s extremely easy to avoid stumbling upon one. If you’re wondering why I personally choose to visit a concentration camp, it is because duty and curiosity always pull me into visiting one. I know this post could easily become very convoluted since my thoughts and feelings whenever I visit a camp are so confusing. One moment they feel utter pain and agony at the sight of a child’s shoe and the next, they form nothing as they blankly stare at the row of ovens in a seemingly inconsequential building. If this post seems a bit jumpy, please know that it took me such a long time to even formulate these sentences and rearrange my thoughts. I’ve never had to convey my thoughts and feelings about visiting a concentration camp before, so I’m not really sure how to go about this. So, I won’t delve into too much and let the history speak for itself. 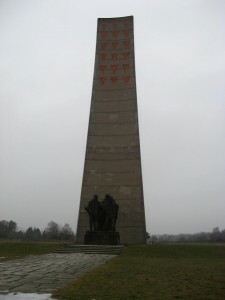 The national memorial at Sachsenhausen. I had been so sick with the flu/cold/virus the second to last week my siblings were here that I had nearly forgotten about taking them to the Sachsenhausen Concentration Camp, which is located in Brandenburg, the German state surrounding Berlin (remember: Berlin is a city-state). 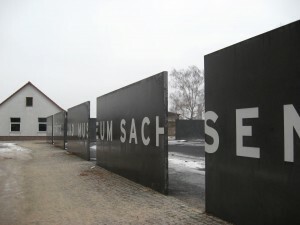 Once we all realized that we hadn’t visited Sachsenhausen yet, we immediately made plans to go visit the following day. 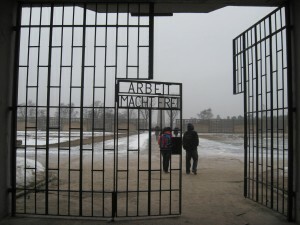 We had visited the concentration camp in Dacchau during Summer 2009 together. I remember that we had discussed what winters would be like for the prisoners as we slowly made our way through the camp on a sunny afternoon with a tour guide. This time, the cold haunted us throughout our journey. The slight draft in the S-bahn when we were at the half-way point to Oranienburg slowly crept into our section and gradually made its presence known. By the time we had reached Oranienburg, we were shivering in our seats. The cold nipped at us as we exited the S-bahn and made our way to the bus. The cold settled on our backs during the bus ride despite the blast of the heater. And finally, the camp. The only solace we found was in the information center when we had initially quickly gone in to get a map, and then briefly again before our journey back for a short bathroom break. The biggest irony was thinking that we could briskly walk away the cold. We were handicapped by the expanse of the sheet of ice that covered most of the camp grounds. The cold was constantly on our minds as we peered at each building, glimpsed at every artifact and attempted to digest the events that had happened there. The worst part was the wind. It greeted us as we stepped off the bus right outside of the camp and accompanied us into the grounds; constantly pushing and attempting to guide us. This entry was posted in Jill Nguyen '10, Fulbright to Germany and tagged Concentration Camp, German History, Sachsenhausen-Oranienburg. Bookmark the permalink.